For some 25 years, Chris and I have had a running dispute. I will try to recount the events that caused the dispute in a neutral, unbiased way. One day after school, Chris and I were sitting around the kitchen table with several other members of our family. We were each drawing pictures and having the others guess what we had drawn, a la Pictionary. Of course, the dispute arises when trying to decide who it was that did this. My side of the story is that Chris did it. Chris’ side is that he did it, but then he lies and says I did it. 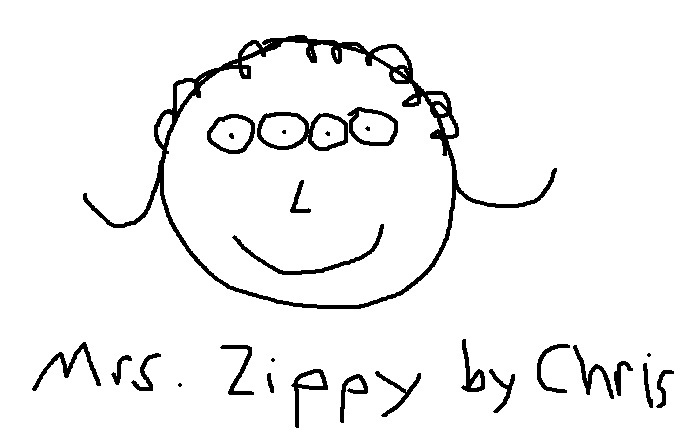 Let me state for the record that I am one hundred and ten percent sure that Chris drew Mrs. Zippy. I categorically deny any and all involvement in the Mrs. Zippy scandal. 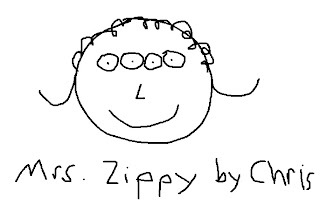 So there you have it, irrefutable proof that Chris was behind the Mrs. Zippy portrait. 1. Clearly, one of us (Chris) had just had a geography lesson. lies! he lies! it was HIM all along!! poor chris, you just need to accept it and own up to your actions. how can you argue with so much evidence?